First, we illuminate the kayaks then depart from Pleasant Harbor Marina and paddle into the sunset towards a quiet cove. We will paddle for about 40 minutes enjoying the beautiful Sonoran sunset as we make our way towards a quiet shoreline where we will enjoy a peaceful fire at the waters edge (contingent upon fire restrictions). We will provide s’mores and the sticks to cook with. We will spend approximately 30 minutes ashore before we make our way back to the marina under the light of the moon/stars. The tour will last 2-2.5 hours. After we return, you are welcome to stick around for live music at our own Dillons Bayou Restaurant and Bar rite here on the marina (Fridays and Saturdays). Should there be a fire-ban in effect, the tour will not shore up mid-trip however s’mores will still be offered. 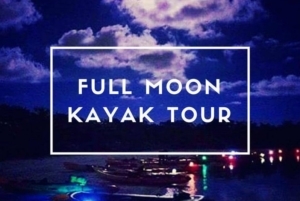 This tour is open to all levels of paddlers. Must bring head lamp and/or flashlight in order to participate. Must be at least 18 years of age. Reservations are required. Credit card is required at time of reservation. No refunds will be considered unless cancelled at least 48 hours in advance. Must arrive on marina at least 30 minutes prior to departure as to check out equipment and sign in. Please allow time for parking and shuttle from parking lot to marina. FYI: Pleasant Harbor Marina is 1/4 mile walk/shuttle from public parking lot up above.